Dr. Michael Clamann hit the ground running upon joining HSRC in May 2018 as a senior human factors engineer. He brings expertise to the Center in the fields of autonomous vehicles, artificial intelligence, and how the two can be paired with the goal of reducing human error — and ultimately improving safety — on our roadways. Clamann’s main research interests includes human-automation interaction and autonomous vehicle technology, specifically, how current and future vehicle technologies can be designed to help improve performance, increase user satisfaction and improve safety. Before coming to HSRC, he worked as a senior research scientist with the Humans and Autonomy Lab (HAL) at Duke University. For more than 15 years Clamann has worked in industry and academia studying how people can effectively team with highly automated and autonomous systems in a variety of domains including transportation, aerospace, defense and telecommunications. Recently, he launched the robotics and artificial intelligence portal for the Duke’s Science Policy Tracking Program, SciPol, where he managed a team of student writers responsible for tracking and reporting on policy developments related to robotics and AI. Clamann’s aerospace work includes: evaluating prototype displays for pilots and air traffic controllers; studying the effects of moving control responsibilities back and forth between an automated system and a human operator; and investigating how training programs are affected by increasing automation. For example, there is a general assumption that adding automation to a system makes it easier to use, but in practice it just makes it “differently complicated” by trading a manual task for a mental task. “A modern cockpit is one of the best examples of a human and a computer sharing control over a complex, safety-critical system,” Clamann said. “It’s a fascinating human-machine interface to explore, with a rich history of developments dating back to the 1950s.” Often, the addition of new technology intended to help pilots has come with unintended consequences and a need for improvements. “With the addition of advanced driver assistance systems and increasing automation, we are seeing a similar situation in modern cars and trucks,” he added. On a personal level, Clamann has a keen interest in experimental psychology, which makes his personal and professional interests a great match for autonomous vehicle research and application. His recent transportation project work focused on identifying methods for autonomous vehicles to communicate with pedestrians, investigating ways to measure a driver’s mental workload and detect distraction while operating a highly automated vehicle, and measuring the effectiveness of using a mobile app to advise pedestrians about safe street crossings. In addition to his researcher position at HSRC, Clamann is currently an adjunct lecturer at Duke University where he teaches graduate and undergraduate courses in human factors, autonomous vehicles, and robotics and artificial intelligence policy. 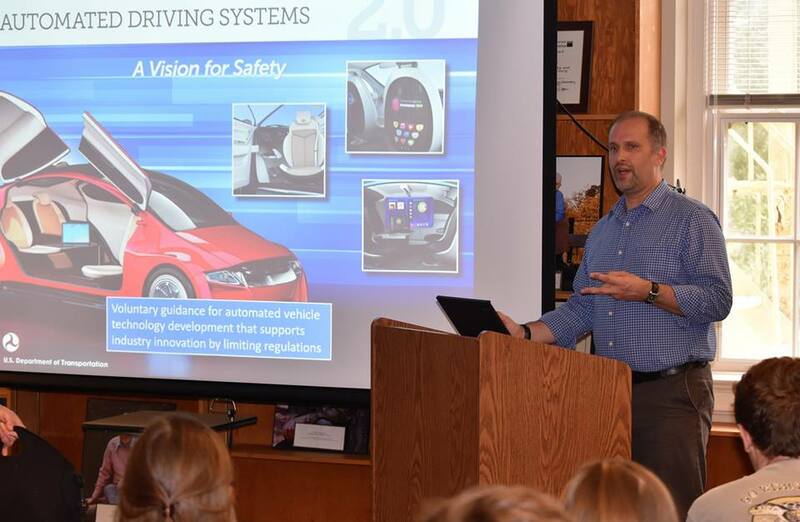 Clamann represents HSRC as a member of the North Carolina Department of Transportation’s Fully Autonomous Vehicle Committee, where he leads the Autonomous Vehicle Research Group. He is a Certified Human Factors Professional, and a member of the Human Factors and Ergonomics Society.